Advanced Veterinary Nursing Diploma for Caroline. Some of you may already know our nurse, Caroline Stevens from our Cat Clinic at Stoke Road. 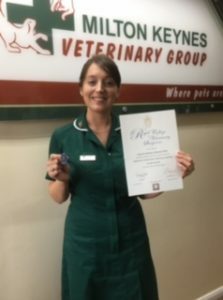 She has been instrumental in us gaining International Society of Feline Medicine’s Cat Friendly Clinic Silver award, ensuring a calm environment for your cats to be treated. 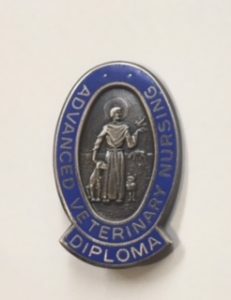 For the last two years, alongside her hard work in the practice, Caroline has been studying for the RCVS Diploma in Advanced Veterinary Nursing, which we are pleased to inform you she has recently passed. The Diploma is an advanced post-registration qualification which involved a combination of modules that she studied both on study weekends at Myerscough College and distance learning. Caroline selected clinical modules that reflected her interests, which included anaesthesia, medical nursing and surgical nursing. Caroline will of course be able to apply her learning to her role as Clinical Coach for our nursing students. We, as a practice, actively encourage continuous professional development and encourage personal growth across the whole practice team.